For me, gifts can be as simple as they can be and they are not supposed to be given only on special or formal occasions since they may be even more fun and substantial when they are offered at moments when nobody is expecting them. That is how I decided to include my cranberry apple tea review in my gifts section and suggest a way to offer your friends, relatives or guests a chance to enjoy a cup of tasteful and unique combination of tea extracts. Here, I could mention that although I am not a tea fan, I can really appreciate a cup of good tea, especially when it is apple tea which is my favorite. So, when I found out about the combination of cranberries and apples in a tea bag cocktail, I felt like giving you some different options of cranberry and apple tea which you can either offer to somebody and enjoy with them a tasty cup of tea or buy it for yourself as a great gift for those cold afternoons that you want to make them feel more cozy. Still, a type of tea like that is also enjoyed iced. Let’s have a look, then, at those options which, by the way, you can also include in a basket gift along with other things that you know the recipient likes or you like and you want to recommend that they try out. The ingredients contained in this tea combination are hibiscus flowers, cranberries, apples, rose hips, chamomile and natural flavors. 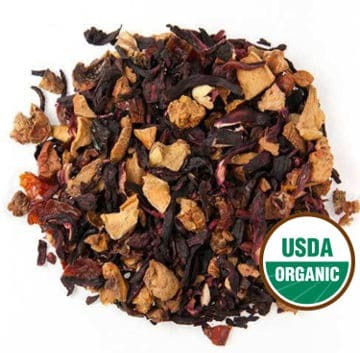 Bigelow cranberry apple tea is an all natural herb tea that does not contain caffeine. People mention that they can’t easily find this blend in local stores and they are happy to find it online. It’s also funny how many of them comment that they were first introduced to this tea when they were offered a cup at a doctor’s office, hospital or at work. 28 individually packaged tea bags in a box. Nice looking box that serves as a dispenser. What Do People’s Reviews Say? People seem amazed by the lovely really delicious sweet taste this blend of tea has. They describe it as yummy, smelling like an apple pie but with a bit of zing coming from the cranberries. They love its red rose color and few have even used the bag for a second time, saying it is perfect even that second time. Something worthwhile mentioning here is that even people who don’t generally like tea commented loving this tea, and that is something which I can totally relate to. The only tea I might very rarely drink is chamomile tea but after tasting red apple tea, it instantly became my favorite. 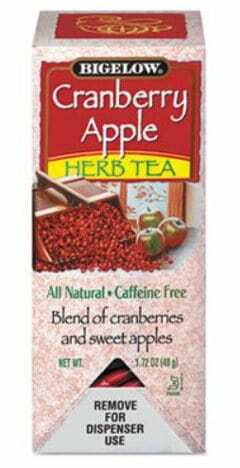 Users think that Bigelow cranberry apple tea has an amazing taste and aroma and say that it can easily be drunk without any sweeteners added to it. People seem to enjoy it at all times both at home and at work, all year round. Still, for those that want the cranberry taste to be stronger than the apple taste, this tea may not be the right option. 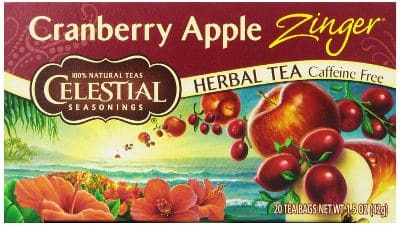 Celestial Seasonings Cranberry Apple Zinger Tea is a 100% natural herbal tea whose ingredients are hibiscus, cinnamon, roasted chicory, apples, yumberries, cranberries, chamomile and blackberry leaves. While cranberries and hibiscus are rich in antioxidants, yumberries are also healthy Asian fruits with an exotic taste. Case of six boxes with 20 stringless tea bags in each box for less waste. Free of caffeine and gluten. People seem to like Celestial Seasonings Cranberry Apple Zinger Tea a lot although some think that this tea has a faint apple aroma and the flavor that is stronger in it is the one of cinnamon. Few others think that its taste is more similar to the one of tart cherry rather than cranberry. A suggestion coming from one reviewer that I think can be useful is not to brew it too long because it can become sour. 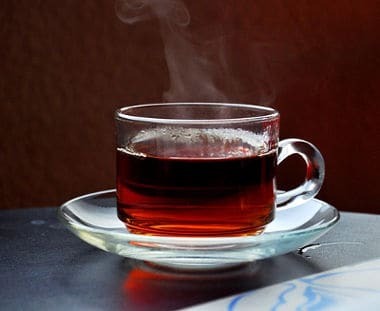 Overall, people seem to really enjoy this type of tea with most of them saying that it is more suitable for Fall and Winter than it is for warmer seasons. This is an organic cranberry apple tea option which is sold loose in a bag and not in individual tea bags. After visiting the company’s site to find out more about their tea, I was blown away by all the different flavors and types of tea they have. 2 oz bag which is packaged fresh only after you order. Unfortunately, there are no reviews for this tea. From the information I could find, it seems that it has a pungent rich fruity character, so its taste is probably close to being tangy and not sweet. In the description of the product, it is also mentioned that it is lightly sweetened but it doesn’t mention what it is sweetened with. In conclusion, after reviewing some different options of cranberry and apple tea, I think that this tea blend makes a really special combination which can become a favorite companion for you, during those day and night moments, or for the people you may want to offer it to.